There's no need to contract for bias material when you can make your own simply and affordably. 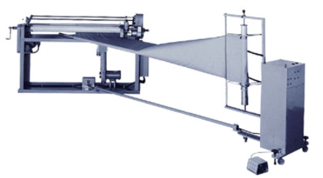 This easily operated unit performs the sewing function in a simultaneous process, sewing straight material into one continuous tubular piece. The seam is ironed flat, and excess material is trimmed. It then re-rolls the material for the next manufacturing procedure. -High speed knife cuts clean, straight edges. -Yardage counter gauges bias material. -Variable tension control on material as it rolled. -Optional, variable speed driver available.